A friend of mine is gearing up to run a couple of marathons in the next two months. I was discussing his training with him yesterday and experienced a mixture of emotions. On one hand, I felt wistful as it has been a couple of years since I’ve run a race. On the other hand, there is a secret sense of relief that my weekends are my own and I do not have to run long distances each Saturday as part of training! I’ve had an injury that has been slow to heal and it’s been a while since I’ve run. However, my conversation with him reminded me of my running journey. When I was in third grade, our history textbook had a lesson on Pheidippides, the Greek runner who ran from Marathon to Athens to deliver the news of a Greek victory over the Persians at the battle of Marathon. At that age, one really does not have a true idea of distances and the 25 miles that he is supposed to have run was an incomprehensible distance to me. My school was probably a couple of miles from my house but it looked really far in my estimation. I grew up regarding all marathon runners as superhuman. This was reinforced by images of the East African runners, lean and gaunt who seemed to motor along at an almost impossible pace as they dominated the races. I wan’t much of an athlete in my High School and besides trying out for a 800 m and 1500 m race in the final year of my high school, I never really qualified for any sporting event. As I have referred to in an earlier post, I did not lack for enthusiasm though! I started running regularly in South Florida in 2003. After a year or so, I had to undergo surgery on my leg for a freak condition unrelated to my running. I ended up with a combined 18 inches of incisions on my left leg with a bypass around a cyst in my popliteal artery and it took me about 4 months before I was able to regain my normal gait. Needless to say, walking was a challenge, forget running. I finally resumed running in 2006. I had worked my way up to 8 miles and I was thrilled. As I had mentioned, I did not lack for enthusiasm and I started scouring online for tips on running. 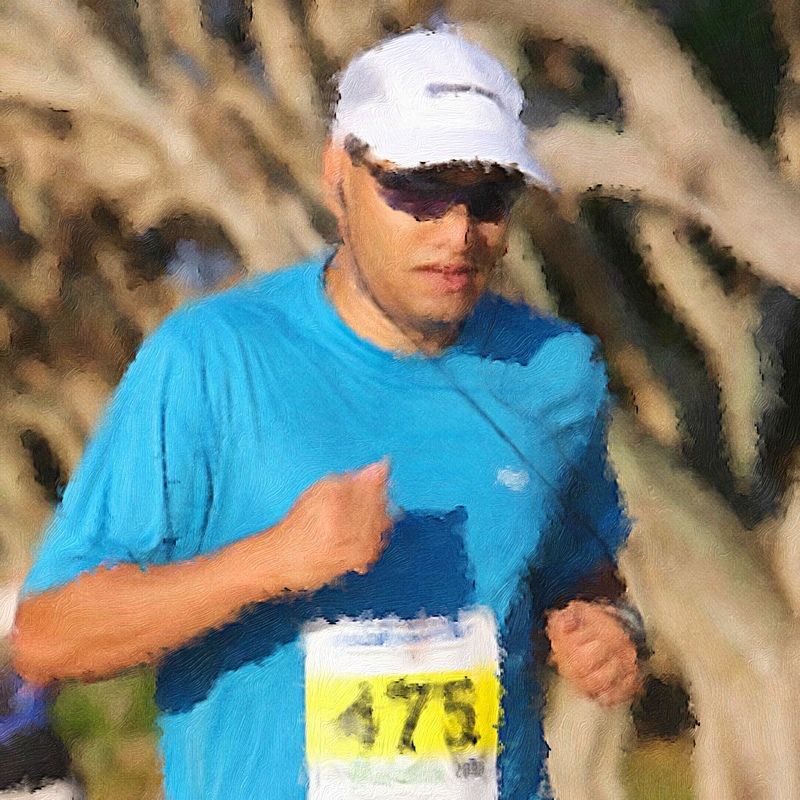 It was then that I came across a 10-mile race to be run at the Wellington Aero Club in Wellington, South Florida. The race was a week away and I signed up. It was October, it was reasonably cool by South Florida standards. I had expected to find my self surrounded by the archetypal athletes, lean and gaunt and thought I would be out of place. I was pleasantly surprised to find people of all ages and fitness levels. The course itself was interesting, it wound its way through a residential flying club. Houses sat on huge lots and as we ran past, an occasional plane would taxi out of a hangar attached to a house, onto a runway and take off. I had feared that I would not be able to complete the race, I had never run the distance before, but I did. I felt pretty good about myself. When I checked the results online later, I was humbled to find out that the two finishers ahead of me were a 14 year old boy and 57 year old woman! I was stoked. I had run 10 miles! I could perhaps run a half marathon! There were about 45 days to go for the Marathon of Palm Beaches and I had just run 10 miles. I signed up and felt very good about myself. I searched online and found Doug Kurtis’s training program for beginners. I was already doing the weekly mileage. However, I was running 8 miles thrice a week. His training program varied the distance, with easy, recovery and long runs. I had bought one of those early Philips mp3 players and I would train with that. I was committed. My son was a couple of months old and my wife was busy taking care of him, so I had to get my daughter ready to school. I had to run 8 miles on Thursdays, so I would wake up at 4:30 am, warm up, run and be back in time to shower, get her ready and drop her off to school. I felt pretty special as I picked up the race packet the day prior to the race along with my shirt, bib and timing chip. The chip itself had to be attached to my shoelaces. I attached the bib to my t-shirt, slept early and showed up excitedly at the starting line the next day. I really enjoyed the race. It was my first one, I was not worried about my timing, so I ran at a steady pace, taking in all the sights and sounds. Each water station had a theme, there were Hawaiian dancers, rock groups and zany looking costumed characters. Onlookers cheered us on and we ran along houses of the rich and famous. When I finished, I walked away proudly with my finisher’s medal. You could say I was hooked. Running at its essence is a simple sport. All you need is a pair of sneakers. Not even that, you can run barefoot if you are accustomed to it. You do need discipline though. On those cold mornings, when you would rather lie in bed, you need the discipline to rouse yourself and log in the miles so you can prepare yourself. We live in a gadget crazy world and it is easy to splurge on heart rate monitors, GPS enabled watches and other running gear. And I did. I bought a heart rate monitor and a Garmin forerunner watch. This was in 2007, the pre smartphone era. I convinced myself that anything that would get me to run was an investment towards my health and worth spending the money on. The heart rate monitor soon fell into disuse but the watch was useful to time my runs and to figure out my splits. In 2008, I signed up for my first marathon. It was a humbling, intimidating and exciting experience. When I worked my way up to 13.1 miles, the distance for a half marathon, I realized that I had to run an equivalent distance to complete the race. I am not a natural athlete and I realized that I had to train regularly and conscientiously. Doug Kurtis’s beginner marathon plan became my bible. I ran the distances recommended, rarely missing a run. The plan is set up to increase the weekly mileage by 10% to minimize injuries. More than any other event, the marathon is associated with a lot of lore. When the Olympics were resurrected in 1896, the marathon was incorporated as an event to commemorate Pheidippides’s run. The Athen Olympics were fittingly won by Spyridon Louis, a Greek. He is reputed to have drunk wine along the way to slake his thirst! The 1908 Olympics were held in London and a distance of 385 yards was added so that finishers would end up under the Royal Box. So all ye runners, who have to trudge the additional 0.2 miles, you know whom you can curse for the additional distance. Women were not allowed to run the marathon. The myth that a woman’s uterus would fall out if she ran the marathon distance held sway for a long time, That did not dissuade women though and some of them ran, disguised as men. Women were officially allowed to run the distance in 1984 at the Los Angeles Olympics. Women have been running ever since and there have been no reports of prolapsed uteruses! As I trained for my first marathon, I started developing a routine. Saturdays were my long runs. I would run an average of 15 miles, working my way up to 23 miles two weeks before the race. Friday night became pasta night, I had to fill up on carbs. I would have a banana and a couple of slices of bread with jam before heading out on my long runs. In South Florida, I would carry 2 camelbacks filled with water and Gatorade. They would weigh close to 3 lbs, strapped around my waist. One of them would be frozen overnight. On particularly hot days, I would be down to the last dregs as I worked my way home. I would lose a few pounds in water weight after my long runs. There are various post long run nutrition strategies but I would just drink a blender full of watermelon juice and then eat later. I discovered GU gels and started carrying a couple of them. I subscribed to Runner’s World and checked out books on running from my local library. I stretched before and after I ran. I bought a pair of sun-glasses and a wicking cap. The simple sport was becoming more elaborate. I also made friends with a couple of runners in my housing complex who were also training for the same event. As we would cross each other on our runs, we would exchange notes on our training and words of encouragement. When I queued up in my corral on the day of the race, I was excited and quietly confident. I had trained long and hard. I had never run the distance before but felt prepared. The first thirteen miles were exciting. This was part of the half marathon course and there were a number of runners and a fair bit of spectators. I had run this course before for my half marathons and I was familiar with the course. The challenge of my endeavor became apparent as I finished half the race. The course was structured such that the marathoners had to pass the half marathon finish line. As I ran past, I saw the half marathoners relaxing after their run, medals around their necks, hugged by family and friends and making their way to the massage tents. I had another half marathon to run! It got tougher as the run progressed. In order to accommodate the distance, the course wound its way through residential areas where there were no spectators. I was alone, the sun was out and the day started warming up. It is at this time that all the long run preparations kicked in. There is an old adage that the first 10 miles are to be run with one’s brain, the next 10 with legs and the last 6.2 with heart. It was all heart now. As runners came abreast or passed each other, we cheered one another, exhorting the other runner to keep running. At mile 23, I felt a perceptible slowing down. All the adrenalin was depleted and I felt I was running on sand with a couple of tires attached to my waist. My legs felt stiff, I could feel the salt on my face left behind by the evaporating sweat. Surprisingly, my shoulders hurt. Keeping my hands up in the running position was not natural. It is then that the songs on my playlist came into use. I told myself that I had to run for another 9 or 10 songs. I focused on each song, paying attention to lyrics that I had never cared about before. The songs seemed to take a lot longer but I was finally around the bend and I could see the finish line and hear the distant cheers. I willed my tired body, and in fact, for the last half mile quickened my pace with a spring in my step. And then I was across the finish line, accepting a bottle of water and my finishers medal. I trudged slowly over to the side, congratulated other runners and called my wife to tell her that I had completed the race. It was a hard days night and I slept peacefully that evening. I bought a copy of the Palm Beach Post the next day, my name along with my time was printed and I filed it away with my bib. I have run a few marathons since then. I’ve realized that one does not have to be a superhuman to run the distance. As long as one has no physical ailments, it is possible to run a marathon. It is more in the mind. To me, the marathon is a metaphor for life. With hard work, some planning, will power and a little bit of luck, one can reasonably achieve one’s goals. Luck because with all the best planning, one could sustain an injury or fall sick and have to bail on the race. Reasonable because ultimately I’m running not to win the race but to improve my own personal record (PR). I am not competing against anybody, I’m competing against myself. Planning is paramount. Without a training routine, I would have no reasonable way to prepare for an event. A well-thought-out routine builds up mileage without injuries. A well planned routine in life helps one get towards one’s goal without drama. Will power is especially important. On those rainy days when it was damp and wet, I needed to rouse myself out of bed, don my shoes and head out. There were days when I searched for all kinds of excuses not to run. There were days when I was fatigued but my mind egged me on. There were times on my long runs when I was tempted to call my wife and ask her to pick me up but my mind willed me on. And running a marathon does not guarantee that you will complete another one. After your rest and possible winter lay off, you have to start again, train regularly, build up the mileage again to complete the race. There are no short cuts. Past performance does not guarantee future results. You cannot Google a solution, you cannot have somebody else run for you. (Though people do, cheats who want to qualify for a time-based race). But when you do complete a race, it is a very satisfying experience. People often look at the finish of a marathon and marvel at the distance run by a runner. That is impressive, but to me what is more impressive is all the preparation that goes into it. For the 26.2 miles that I run on the day of the race, I would have run about 600 miles in preparation for it. Alone, through rain and sun. On weekends and weekdays. Fighting my mind that tells me it is okay to take a couple of days off and my body which tries to convince me that it is a sack of potatoes. When I look back, I enjoyed that training. The long runs were grueling but also almost meditative in nature. There were days when after running 15 miles or so, I would be weary and tired and my feet would be dragging. A song that I had not heard for a long time would suddenly pop up on my playlist and for reasons unknown to me, I would feel lighter. My steps would quicken and for a mile or so I cruise. I have never experienced the runners high that people talk about, but I guess this is the closest I got to it. In those moments I felt that I could run any distance and I would wonder why I felt so tired earlier. I would float through the air with a sense of exhilaration. The feeling never lasted, after a mile or so, I would be back to reality and my body reminded me that I was just deluding myself. It did not matter though. For a few moments, I experienced a rare state of freedom, without any cares. There was a lightness of being. I last experienced such moments as a young boy, running on the streets in Bangalore on Friday evenings. Not a care in the world, running just for the sheer joy of it. Living in the moment. I don’t think I can experience that, but so long as I can run, I will be happy! Lovely. “Bhag Nayaka Bhag”!! Your journey in itself is truly inspirational Rajesh. Another aspect of all this is to listen to your body all along, it speaks to you, attend to it. It is OK to will your way thru some things, and best to listen to your heart and attend to your body – that too is part of the process of preparation I suppose. Thanks, Naren! Yes, the pros don’t listen to music when they run, they are mindful, keeping track of how their body is responding. With your meditative practices, you no doubt are keenly aware of this. I do remember that you were an excellent sprinter in high school!